March 25-28, 2012, in Washington, D.C., click here. When filling out the registration form, select “Press” for a complimentary registration. Media credentials allow access into all regulatory round tables, general sessions, seminars, classes, new product introductions and the AEA Exhibit Hall. 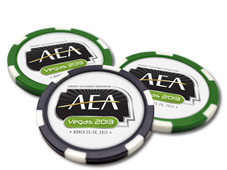 These credentials do not include tickets to AEA-hosted social functions, which can be purchased separately from the AEA. After registering online, a confirmation will be sent to the email address you provide. Media credentials will not be mailed prior to the convention; they can be picked up at the AEA Registration Desk at Gaylord National, which is the 2012 convention hotel. Please provide a business card when picking up media credentials. These credentials are required for entrance into the AEA Convention Press Headquarters and all other convention activities. Monday, March 25 Noon - 5 p.m.
Tuesday, March 26 8 a.m. - 5 p.m.
Wednesday, March 27 8 a.m. - 5 p.m.
Thursday, March 28 8 a.m. - 11 a.m.